Footstool Publications offers books expounding the Christian faith, with emphasis on the Anglican worldview. It is our mission to distribute God-honoring materials to the people of God, and to help them in their growth in the grace of our Lord Jesus Christ. We seek to honor God and His infallible written Word, the Bible; to edify the saints; to help pastors in their ministries and seminary students in their search. As such, we promote literature from ancient times and modern times. I was born a baby boomer, and I was reared in the Christian faith. I entered Electrical Engineering out of high school and almost lost my faith to evolution. Then I read a book by an evolutionist who admitted many problems with evolution that contradicted the thesis, and I’ve never looked back. I might add that what I read was G. A. Kerkut, Implications of Evolution (New York: Pergamon Press, 1960), and he gave these improvable assumptions: life came from non-life; all life is related because life only sprang into existence once: viruses, bacteria, plants, and animals; Protozoa (one cell animals) gave rise to Metazoa (many cell animals); Invertebrates (no back bone) gave rise to vertebrates (animals with backbones); reproduction went from one cell division to sexual copulation; yada, yada. I’ll post more of these assumptions under evolution so search for that. (I might add that this is not just the God of the gaps, as evolutionists are fond of saying, but contradictions to their theses. They claim that we fill the gaps in their theory with God. Rather the opposite is true, Darwinism has changed enormously from its inception, and we now have Darwinism of the gaps. In other words, they keep changing the theory to adjust to new evidence. For example, to account for huge time gaps in the fossil record, they have invented “punctuated equilibrium”, the idea that evolution occurred very quickly at some points. This is a theory in search of facts, otherwise known as circular reasoning. To this day, I read widely from evolutionists and atheists to Christian theism and intelligent design. I’ve been reading the New Atheists who are very militant against Christianity. My blog will discuss their works on occasion, and I have several books reviews of them posted. I taught Hebrew and Greek at Cranmer Theological House for 20 years, and I’m still teaching there part time (theology, various books of the Bible, practical courses). I’m now retired from the ministry, but still teaching in one of our seminaries part time in Dallas, TX. Between Electrical Engineering and Bible College, I was drafted into the Army for two years. I was in the infantry in Vietnam during the TET Offensive where I earned the purple heart, bronze star for saving lives, and the CIB (Combat Infantry Badge). I attended Bible college for three years (B.A.) and then seminary (Dallas Theological Semnary) for four years (Th.M.). I took four and a half years to write my doctoral dissertation at yet another seminary (Th.D. ), which is now a book: Man as God: The Word of Faith Movement. I have written other works that are listed here. Some of my favorite areas of theology to read and teach in seminary are the Holy Trinity, person and work of Christ, hermeneutics, Cure of Souls, Greek exegetical grammar, and generally in the area of theology. Currently, after 38 years, I have retired from the ministry, having been the founding pastor of St. Francis Anglican Church in Spring, TX. One of my students from the seminary where I still teach has taken the church. I’m the dean of external studies at Cranmer Theological House (www.CranmerHouse.org), a seminary in the Reformed Episcopal Church. I was reared Southern Baptist, joined a Bible church in my mid teens, read my way into Presbyterianism and then into the Reformed Episcopal Church where I’ve served since May 1991. 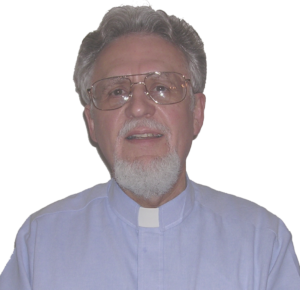 You may hear some of my sermons at: http://www.sermonaudio.com/source_detail.asp?sourceid=nicea325. Also, I have a Facebook presence, google+, linkedin, twitter (@curtiscrenshaw), youtube (curtis crenshaw). Just search for curtis crenshaw on these social media. I have written six books, thousands of pages of class notes, and have more projects to write than life left to finish them. See the category on the right of this screen about my books (“Books I’ve written”). Go to http://www.ftstl.com . 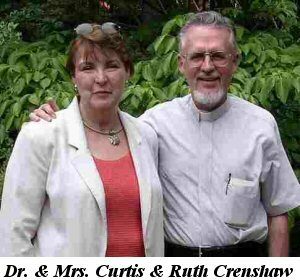 I married my wife Ruth in 1969, and we have two children and four grandchildren, all of whom are in the faith. The Triune God has truly blessed us!